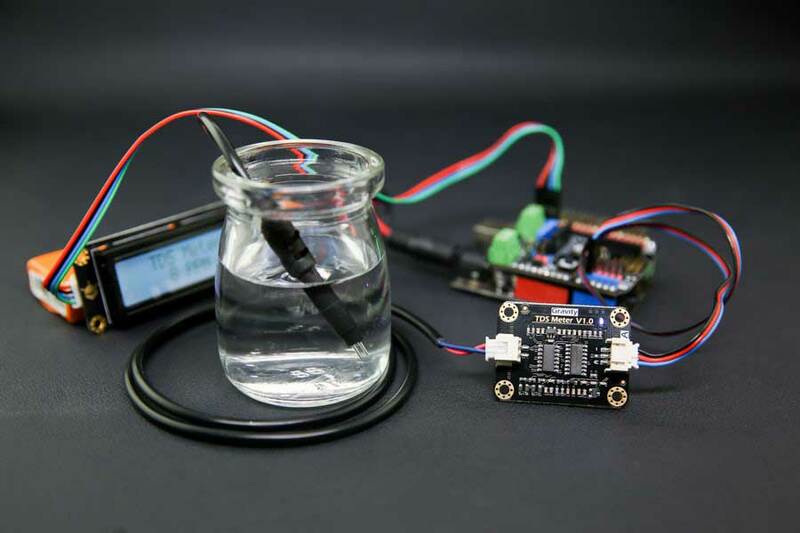 This is an Arduino-compatible TDS sensor/Meter Kit for measuring TDS value of the water, to reflect the cleanliness of the water. It can be applied to domestic water, hydroponic and other fields of water quality testing. TDS (Total Dissolved Solids) indicates that how many milligrams of soluble solids dissolved in one liter of water. In general, the higher the TDS value, the more soluble solids dissolved in water, and the less clean the water is. Therefore, the TDS value can be used as one of the references for reflecting the cleanliness of water. TDS pen is a widely used equipment to measure TDS value. The price is affordable, and it is easy to use, but it is not able to transmit data to the control system for online monitoring to do some water quality analysis. The professional instrument has high accuracy and can send data to the control system, but the price is expensive for the ordinary people. To this end, we have launched an analog TDS sensor kit which is compatible with Arduino, plug and play, easy to use. Matching with Arduino controller, you can build a TDS detector easily to measure the TDS value of liquid. This product supports 3.3 ~ 5.5V wide voltage input, and 0 ~ 2.3V analog voltage output, which makes it compatible with 5V or 3.3V control system or board. The excitation source is AC signal, which can effectively prevent the probe from polarization and prolong the life of the probe, meanwhile, increase the stability of the output signal. The TDS probe is waterproof, it can be immersed in water for long time measurement. This product can be used in water quality application, such as domestic water, hydroponics. With this product, you can easily DIY a TDS detector to reflect the cleanliness of water to protect your health. 1.The probe can not be used in water above 55 degrees centigrade. 2.The probe can not be left too close to the edge of the container, otherwise it will affect the reading. 3.The head and the cable of the probe are waterproof, but the connector and the signal transmitter board are not waterproof. Please be careful.